mommy bytes: Be Off to King Richard's Faire! Be Off to King Richard's Faire! For years, we've (I've) been trying to go to King Richard's Faire in Carver, MA, without success. From Dova's broken foot last year, compounded by mononucleosis, plus Adam's soccer and marching band schedules, and (gasp!) overall lack of enthusiasm, it's been nearly impossible for our family to get there over the years. This year we finally frolicked in the colorful world of knights, elves, dragons and saucy wenches. First stop were the SKY Chairs. At $89.95 they seem quite reasonable until you factor in the construction of a shaded porch to your house. If you have a porch or ample indoor swing space, get one, they are super comfy! Even skeptical Adam enjoyed them (note cute girlfriend behind). Don't feed the dragon! But he will pet your bun (in your hair). Next stop was Daniel, Duke of Danger. Yes, Mr. "Inconceivable" is balanced upside down on his head while playing "Ode to Joy" on two whistles. 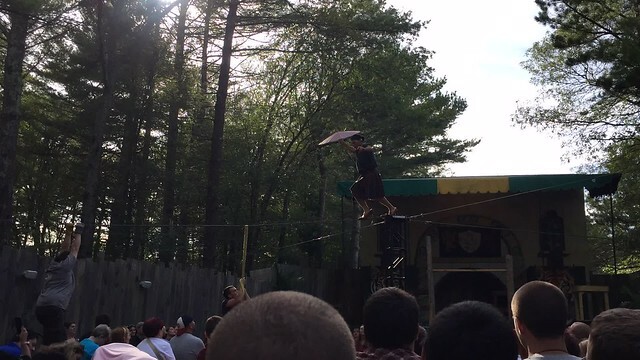 Not to mention juggling fire and spinning plates on top of a ladder. I have enough trouble with a step ladder with four legs, let alone two! Some of the shows were PG-13, so I sent Adam to watch the Torture Show without Dova. Little did I know that it involved fish hooks in the eyes! Adam, like myself, is too squeamish for such acts. I couldn't bear to watch Ryan Stock and AmberLynn on America's Got Talent this year, but Dova was glued to the TV, eyes wide open, while Ryan hung from a hook through his nose. She was sorry she missed seeing a nail hammered into a face live. Eek! Another fun show we saw was Squire of the Wire. For his finale, he walked a tightrope in high heels! Not to spoil your visit, here's a one second time-lapse sneak peek. Dova marveled at the "unsafeness" of all the carnival games. Usually throwing darts at balloons are the most dangerous thing at a regular fair. She wanted to throw something dangerous, so I let her choose between axes, knives and ninja stars. She choose axes of course! 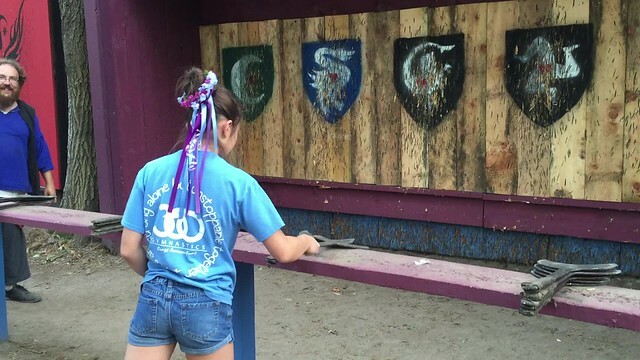 When do you get a chance to throw axes? This one almost stuck onto the board. There were merchants galore, many set up in the permanent buildings just for this fair nestled in the woods of Carver, MA. There were so many colorful and beautiful crafts to choose from! We bought a double spoon holder from Pottery by Sutter (also see mugs and goblets above). The glazing is gorgeous! Doug chatted with Sutter and learned that he brought his ceramics to this fair from Wisconsin every year. That's a lot of inventory to ship! He said that the first time he came to King Richard's Faire years ago, he and his mom never sold so much in one show before. Clearly well deserved, buy it up, people! The only other item we purchased was this head band for Dova, which can can be worn as a traditional floral headband or a bun decoration as she preferred. Adam was fascinated by the swords forged by blacksmiths, but that was clearly out of our budget! The crowds were teeming with Cosplay so you never knew who worked for the Faire or not. There was plenty of people watching to be had, including chain mail and medieval corsets. I learned from Doug that the term cosplay comes from "costume play". I've heard the term before, but never knew where it came from, duh! Here's the obligatory selfie where I'm shocked to see that Dova is almost as tall as I am. When did that happen? There were so many shows we couldn't possibly see them all in one day. But I wasn't going to miss the jousting! Alas, there is no real death in "Joust to the Death" but the stage play was still fantastic. Now, the real question is, how much does all this fun really cost? Before going, I researched it and found lots of complaints that the fair was mostly cash only (especially food), with some merchants accepting Master Card and Lady Visa (love the renaissance take!). I read that food was expensive and all the performers begged for tips. Our budget was tight, but we made the most of it. If you're lucky enough to snag Groupon tickets before season, that will help defray costs. We were grateful to obtain promotional tickets which didn't require writing this glowing review. Next time, I would start with less tickets to spare the extra stuff after the drinks and maybe go for the pricier $12 turkey legs which smelled delicious. I also wanted to try the $6 loaded baked potato (pud-da-doe or something like that), but it was "5 more minutes" for about 15 minutes and I gave up. Also, anything alcoholic started at $10, so out of the question for us. Keep in mind that King Richard's Faire is only around for two months on weekends in September and October. It is permanently located in a enchanted forest with buildings and landscape to maintain. Considering the overhead, all the prices need to be inflated, it doesn't happen by magic! Disclaimer: I received admission tickets courtesy of Dennehy PR, but no blog post was required. We really did have a blast!